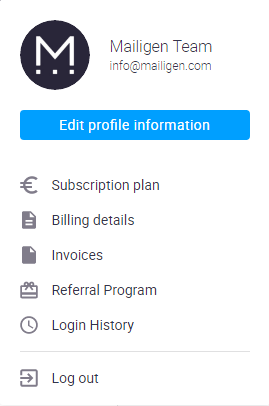 My Profile Information: How Do I View My Past Invoices? We keep a detailed record of all your past invoices. Select the Invoices option from the Profile Menu in the upper right-hand corner. This will display your current and past invoices. Order ID—the unique Order ID for the invoice. You can click on the Order ID to view and/or print it. For more information about printing invoices, see the sub-topic below. Description—a description of the invoice. Amount—the amount of the invoice. Paid—whether or not the invoice has been paid. If you are on a monthly payment plan (or have add-on services that are billed monthly) you can elect to have your payments made automatically rather than remitting an invoice each month. To turn this setting ON or OFF, simply click the Change Settings Link underneath the Automatic Payments Heading. Note: If auto payments are not enabled for your account you won't see this option. To view an invoice click on the link in the Order ID Column of the Invoices table. This will open a pop-up window where you can view the invoice details. Once you have opened an invoice for viewing, you can click the Print Invoice Button from the pop-up window to send it to your local printer.